Reference number for this case: 30-Sep-54-Willer. Thank you for including this reference number in any correspondence with me regarding this case. On October 5, 1954, the regional newspaper L'Alsace in its French edition at least, reported on page 10 that "flying saucers" were seen in the sky of the Sundgau, the area south of the Haut-Rhin. The newspaper reported that in the afternoon at about 4 p.m., two girls from Willer who worked in the fields, B. M., aged 16, and her sister C., aged 20, saw in the sky, passing at high speed, two dark-colored and oval discs one on the top or above the other. These objects reportedly emitted absolutely no light and made no noise. They quickly disappeared in the direction of Windenhof. The newspaper adds that farmers from Grentzingen said they also saw, the same day, at the same hour, the two mysterious craft. 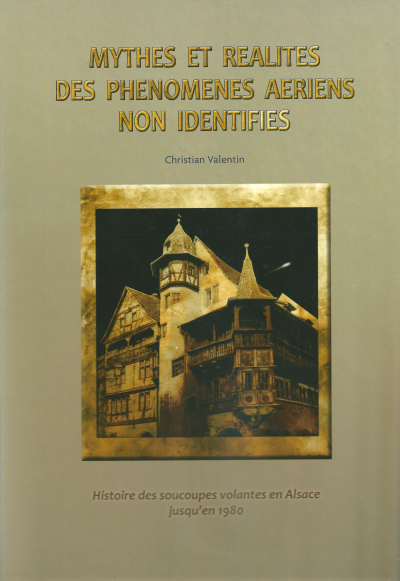 The case later appeared in the UFO litterature with a wrong date and almost no details, probably because it was found by ufologist Aimé Michel in a later article in L'Alsace that mentioned it again but did not give the date and the details. They emitted absolutely no light and made no sound. The two dark "objects" quickly disappeared in the direction of Windenhof. The same day, at the same hour, other witnesses, some farmers, also of Grentzingen, also say they saw the two mysterious craft. The newspaper reports on October 6, 1954, with no other information, that there was a sighting in Willer, the Haut-Rhin. The date is not given but the sighting is mentioned among others that took place on October 2 and 3, 1954. Aimé Michel reports that there was a sighting on October 2, 1954, in Willer, France. Luc Chastan indicates in his database that in the Haut-Rhin in Willer on October 2, 1954, at an unknown hour, there was an observation of a disc. Patrick Combes copied the [lc1] source, crediting it by a link. In this book, he lists the case for Thursday, September30, 1954, at 16:00 in Willer in the Haut-Rhin. without the first article in the newspaper L'Alsace for October 5, 1954, it was not possible for me to see that the date given by Vallée, Michel, Chastan, was wrong. The description, very meager, was not right either as this was not "one" disc but two, etc. So we have here a case that became stranger again than it was in the UFO literature case, with among other things, what seems to be independent witnesses. Unfortunately it was apparently not investigated and many details are missing, such as angular size, angular speed, distances, etc. So there is not way to disprove that it may have been planes of helicopters, as in the distance they make look like oval-shaped, and silent. Willer, Grentzingen, distant from center to center of about kilometers. We do not know ehere the witnesses were, we only know the girls were from Willer and the men from Grentzingen. 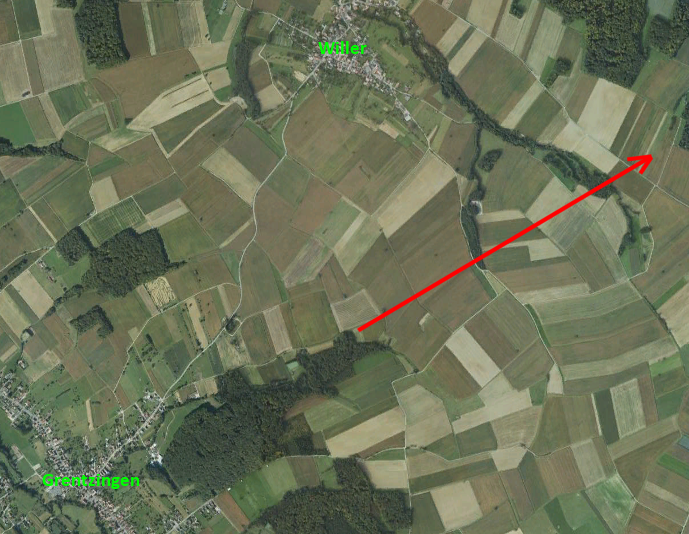 The Windenhof, near Jettingen, seen from the start of the arrow would be in the direction indicated by the arrow. But again we do not know where the girls were so the arrow does not tell us anything absolute. 1.2 Patrick Gross February 19, 2014 A search on the web and my file revealed no other information. Addition of the Summary. 2.0 Patrick Gross March 26, 2014 Additions [al1], [cv2]. Change of case date, was previously September 2, 1954. Summery rewritten according to [al1]. The old summary said: "The regional newspaper 'L'Alsace' reported on October 6, 1954, with no other information, that there was a sighting in Willer. It may have occurred on October 2 or 3, 1954." 2.1 Patrick Gross December 18, 2014 Addition [pc1]. 2.2 Patrick Gross July 15, 2015 Addition [sp4]. 2.3 Patrick Gross January 21, 2017 Addition [ub1]. This page was last updated on January 21, 2017.